Many families entertain the idea of getting a pet at one time or another. Sometimes it is the children that insist that their lives will not be complete without a friendly pet to have fun with. Other times it is the parents who suggest that adding a family pet would bring focus and responsibility to their children. Regardless of who wants the pet most, it is true that adding a pet to many families is a source of fun, learning and family bonding. Most families immediately think that they can choose between getting a cat or a dog simply because those are the most popular pets to have. Before you run out and purchase the perfect kitten or puppy, consider choosing a bird to be your family pet instead. Perhaps many people think that owning a bird is reserved for the wild at heart or certainly for those living in a tropical climate. You'd be surprised, however, to learn that a wide variety of people in almost every climate in the world are proud bird owners. Feel a little unsure? Take some time to learn about the different kinds of birds that might be suitable pets for you and your family. Visiting a local pet store can be a great place to begin gaining knowledge. Don't be afraid to ask the store workers any questions you have about owning a bird or about the differences between varieties of birds. Learn as much as you can before you make your final choice. Think about the ability of your family to care for a pet and then only choose a bird that you could really care for and enjoy. One kind of bird might require more attention than you can give while another variety of bird might be perfect to fit your family's busy schedule. The worst thing you can do is to bring home a bird that is unsuitable for your family. No one will be happy with a bird that needs to be cared for by the hour and that makes loud noises throughout the night. Consider all of these details carefully. If you decide to choose a bird as your first or next family pet, take the time to educate your entire family on the bird. After you have taken the time to learn, teach your family important facts about the bird and about the needs the bird will have when it becomes a part of your family. Be honest from the beginning about the serious responsibility and privilege that having a pet is. Especially your children need to have a proper understanding that a pet bird will not be all fun and games. Choosing a bird for a family pet can be a unique and fun way to bring an animal into your home. 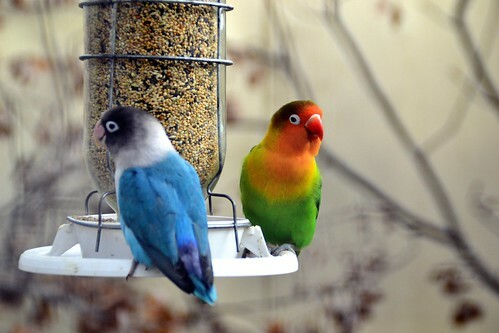 Many birds are easy to maintain and can bring hours of laughter and fun into your home.